Recently, the FDA approved the new fat dissolving treatment called Kybella. Kybella is a medication that is used to treat excessive fat under the chin. Kybella is a good treatment for patients who have an unsightly double chin. The treatment is done as a series of injections into the fat. Treatment sessions only take about 15-20 minutes. Depending on the amount of fat present, patients typically need two to four treatments. Kybella is the first and only FDA approved medication for the reduction of fat. It works by disrupting the fat cell membrane, which ultimately leads to the loss of fat in the treated area. Kybella will become available for use later this year. Any of our patients who feel they have unattractive extra fat under their chin and would like to remedy this without surgery or liposuction are invited to call our office at 310-829-9396 and add their name to our Kybella interest list. KYBELLA™ (deoxycholic acid) injection is the first and only FDA-approved prescription nonsurgical treatment that is used in adults to improve the appearance and profile of moderate to severe fat below the chin (submental fat), also called, “double chin.” It is not known if KYBELLA™ is safe and effective in children less than 18 years of age. Dr. Amerian and Dr. Anterasian will customize your KYBELLA™ treatment regimen, including how many treatments you need, based on your desired chin profile. They will give you a series of injections at each treatment session, which are spaced a month or more apart. Many patients experience visible contouring of their chin profile in two to four treatment sessions spaced at least one month apart. Up to 6 treatments may be administered. 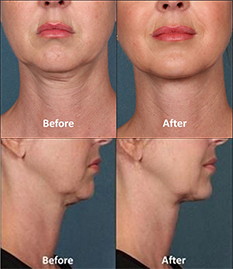 Welcome the first and only FDA approved treatment for double chins and submental fullness! We now offer Kybella in Santa Monica and Los Angeles .